Here we share How to Downgrade Huawei P10 Plus from Android Oreo to Nougat. Recently Huawei released the latest Android 8.0 Oreo update for Huawei P10 Plus. The update is quite stable, but If you update your phone but don’t like the update for any reason, then you can easily revert Huawei P10 Plus to a lower version (Android Nougat). You need to download Stock Nougat firmware to Downgrade Huawei P10 Plus from Android Oreo to Nougat and the process is very simple. Check below guide to Downgrade Huawei P10 Plus from Android 8.0 Oreo to Android Nougat. Stable Oreo version is available for Huawei P10 Plus but many device owners are still not happy with the update for various reasons. 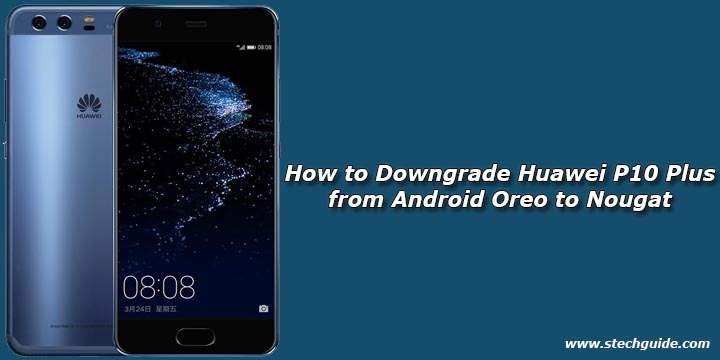 If you are one of the users and would like to Rollback Huawei P10 Plus from Android Oreo to the Nougat version, then you are in the right place here we share the method to Downgrade Huawei P10 Plus to Nougat from Android Oreo. You need to unlock the bootloader of Huawei P10 Plus first, Skip it if you already had it unlocked. 2) Put update.zip, update_data_public.zip, and update_all_hw.zip files into HWOTA8 repack directory. (Rename the files as mentioned if downloaded with different name). 3) Run repack.bat to update zip files. 4) Now boot your device into fastboot mode by using Volume Down + Power. 4) Disconnect USB cable and boot your device into TWRP using Volume Up + Power. 5) Create “HWOTA8” folder in sdcard using MTP. 6) Put hwota8_update.zip, MHA_RECOVERY8_NoCheck.img, and three Huawei update package files from repack directory into “HWOTA8” directory. 7) Now in TWRP select install and flash hwota8_update.zip via TWRP. 8) Now Enter recovery and do a factory reset.